Google held its annual developer conference this week, and during Wednesday’s keynote, the company touted its work in education, including the growing adoption of Google Apps for Education (some 25+ million users worldwide) and Chromebooks (engineering exec Chris Yerga highlighted its recent country-wide implementation in Malaysia). The store, which will launch this fall, will allow schools to search for education apps by subject matter and by grade level. Applications are open now (that's why Google announces these sorts of things at a developer event), and Google says that the apps submitted to the store will be reviewed and recommended by educators, who will help to categorize and align them with the Common Core State Standards. The new app store will accept purchase orders as well as other payment methods, and Google says that distribution of content onto devices will be wireless (as opposed to the still sadly commonplace hardwired syncing), sending apps, books, and YouTube videos “to individuals or groups of any size, across classrooms, schools, or even districts.” Simplified device management is a big deal, enough for Free Technology for Teachers' writer and educator Richard Byrne to suggest that the new offering "promises what we've been waiting for." Cue the technology bloggers’ hyperbolic excitement: “Google Play for Education could kill the iPad in schools,” predicts VentureBeat. 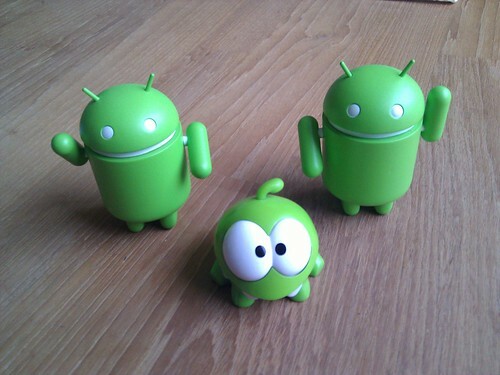 “With Google Play For Education, Google Looks to Challenge Apple’s Dominance in the Classroom,” according to Techcrunch. 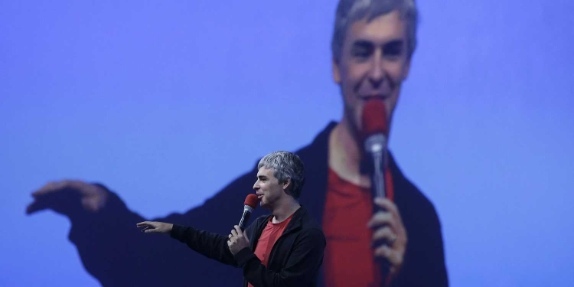 It’s a predictable response, no doubt, with a twist of irony too considering that Google CEO Larry Page lamented during his Q&A session at the end of Wednesday’s keynote that these sorts of headlines have become commonplace. Page argued that the technology press always (and as he tried to insist, unnecessarily) frames Google as “versus” someone else. Let’s be honest though. It is impossible not to view Google’s education products (heck, a lot of its products) as anything but a move “against” others. Google Apps for Education versus Microsoft’s Office and the (now rebranded) [email protected], for example. 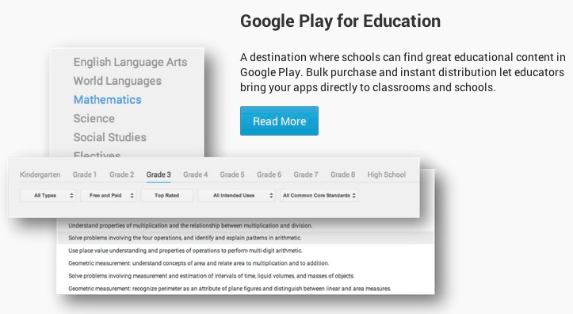 And now Google Play for Education versus the Apple App Store. Google Play for Education versus News Corp’s Amplify tablet, which like many non-Apple mobile devices, is running a customized version of Android. Google Play for Education versus “Whispercast,” Amazon's recently-launched wireless (Kindle/Android) e-book and app deployment tool for schools. Google versus COPPA. Google versus the Web. 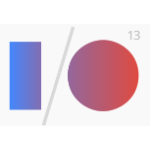 When I attended Google IO last year, I wrote about my interpretation of the company’s education plans as a response in part to Inside Higher Ed Joshua Kim’s complaint that Google hadn’t made any education-related announcements at its developer conference, particularly as it unveiled a new Android tablet – the Nexus 7. And while sales numbers might say one thing, it's still an open question whether tablets are really the best computing devices for students, particularly those in middle school and up, who need (if nothing else) keyboards. Yes, tablets are cheaper than laptops. Yes, there are lots of fun and exciting apps. Yes, tablets offer digital texrtbooks with touchscreen page-turning and embeeded videos. Woo. Hoo. Tablets facilitate consumption and content delivery, but they haven’t really changed the way we teach and learn. They are not the powerful computing devices as envisioned by Seymour Papert et al. And with their emphasis on app marketplaces and app ecosystems and not on openly-licensed content the World Wide Web, tablets raise all sorts of other problems for education. I wasn’t just wrong about “Google’s interest in education," insofar as it’s trying now to carve out its own chunk of the volume-buying educational app market. I was wrong more generally about Google and its relationship to the (open) Web. Indeed Google admitted at IO this year that it’s dropped the messaging standard XMPP in its newly launched Hangouts app (XMPP was once a key piece of Google Wave — remember Wave? How it was going to “change education forever”?). Furthermore, as software engineer Laurent Eschenauer observes, “Google+ has no open RSS output, hence no PuSH support, no write API, in fact it has absolutely nothing open; Google Reader is scrapped, along with RSS support within Chrome; WebDav for Google Calendar is dropped in favor of their proprietary API." Education data analyst Tony Hirst has lots more examples to add to that list — Fusion tables, gadgets, image files — “Google Lock-In Lock-Out,” as he calls it. Google: on the Web and indexer of the Web, but no longer really, truly of the Web. At Wednesday’s Google IO keynote, Google Senior VP Amit Singhal announced “the end of search” — a shockingly provacative announcement, I guess, since this is the product that Google is still most associated with and, let’s be frank, the product through which, thanks to advertising, it still gets the bulk of its revenue. After a dramatic pause Singhal actually announced “the end of search as we know it,” unveiling new voice-activated search interface which can purportedly “answer, converse and anticipate” users’ questions. Of course, all this has been generated from Google’s vast data gathering and computational capabilities. Google knows who you are. Google knows where you are. Google knows your search patterns. Google's recently written Terms of Service can track this across all the Google product offerings. Google boasts it's getting better at predicting your questions and as such autocompleting your questions. (It also removes wrinkles in photographs, and thanks to image recognition and sentiment analysis, claims to know the best and happiest photographs from your family vacation albums.) "Welcome to Google Island," as Wired's Mat Honan writes in his post-4-hour-Google-IO-keynote-escape-fantasy. How might this relate to Google's plans to “Play for Education”? Clearly user data (aka student data) is increasingly valuable to all (education) technology companies, and Google is hardly alone here as it strives to construct walls around, extract value from, and, as I wrote last week about MOOCs and textbook publishers, "enclose" education. An app store and a mobile OS do that quite nicely. Google has long benefited from the label of “open” and has long acted as a defender of open standards, open source, and the open Web, When Google says now that it's keen to have classrooms move towards the Android OS (versus its Web OS) and towards its curated education app store, we should be sure to consider all the things that Google's "play for education" could entail.